The latex is the milky white sap produced by many plants such as the the poinsettia and the milkweed, that coagulates on exposure to air. 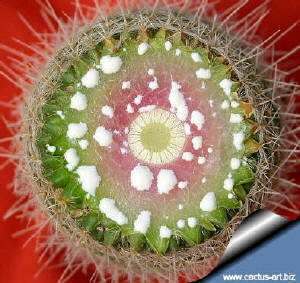 of Mammillaria geminispina (cross-section) It is a complex emulsion in which proteins, alkaloids, starches, sugars, oils, tannins, resins and gums are found. Usually plants latex is white, but some have yellow, orange, scarlet or colorless. The cells or vessels in which latex is found make up the laticiferous system. This specialized vessels are called latex vessels. In the Asclepiadaceae and Euphorbiaceae families the laticiferous system grow into a branching system extending throughout the plant including roots, stems, leaves, and sometimes the fruits. In some plants the latex is a form of stored food while in other is an excretory product in which waste products are deposited. But the primarily function of latices is to protect the plant in case of injuries, drying to form a protective film that prevents the entry of fungi and bacteria. Also, it may be a defence against herbivorous animals, in view of the fact that in some plants latex is very bitter or even poisonous. It may be that latex carry out all of these functions to varying degrees in different plant species. The latex of the rubber tree is used to make the rubber. A laticifer is a plant part producing latex: a duct that produces latex in some plants. The laticiferous system is the simple or complex structure of cells or vessels in which latex is produced, stored and transported. Laticifer can be localized in single organs or extended to the whole plant body.